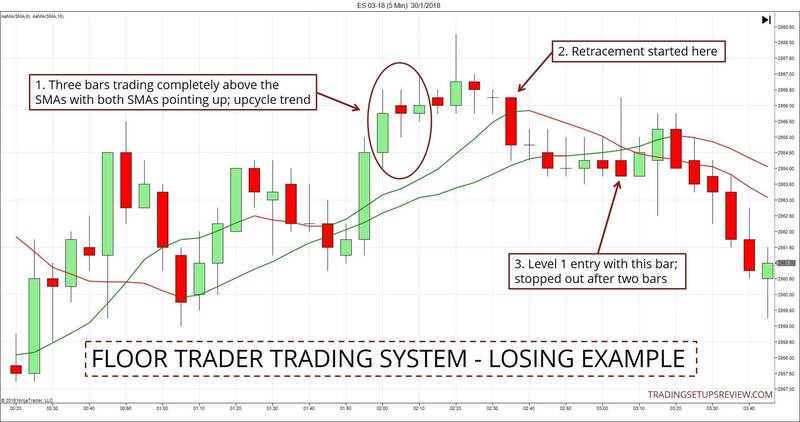 The Floor Trader Trading System is an excellent retracement strategy found on Trading-Naked. It uses two moving averages to determine the trend. Then, it uses a simple pullback formation to enter the market. But don’t let its simplicity deceive you, there are subtle factors you need to take note of for it to be effective. More on that later. Now, let’s introduce the trading rules. Note: I’ve interpreted the source material with my observations to form the trading rules below. Hence, there are slight differences. The key strength of the Floor Trader Trading System is its ability to keep you out of the market. 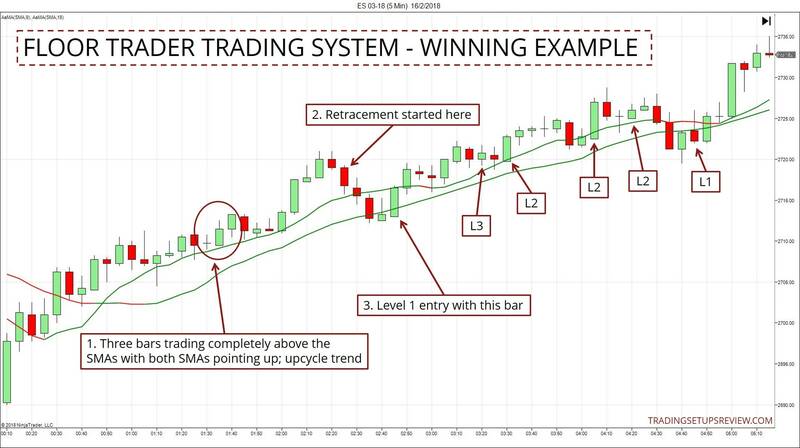 It allows you to enter a trade only when there is a stable trend in place. This trait is essential for any retracement strategy. Hence, the first step is to determine the trend. Price trading above both SMAs for at least three consecutive bars. The 9-period SMA should be above the 18-period SMA. Both SMAs should be sloping up. Price trading below both SMAs for at least three consecutive bars. The 9-period SMA should be below the 18-period SMA. Both SMAs should be sloping down. There are three entry levels. Level 1 is the most conservative entry, and Level 3 is the most aggressive. The market must be in an uptrend cycle. Level 1 – Buy with a higher bar high after price retraces down to the 18-period SMA. Level 2 – Buy with a higher bar high after price retraces down to the 9-period SMA. Level 3 – Buy with a higher bar high after price retraces down without touching any of the SMAs. 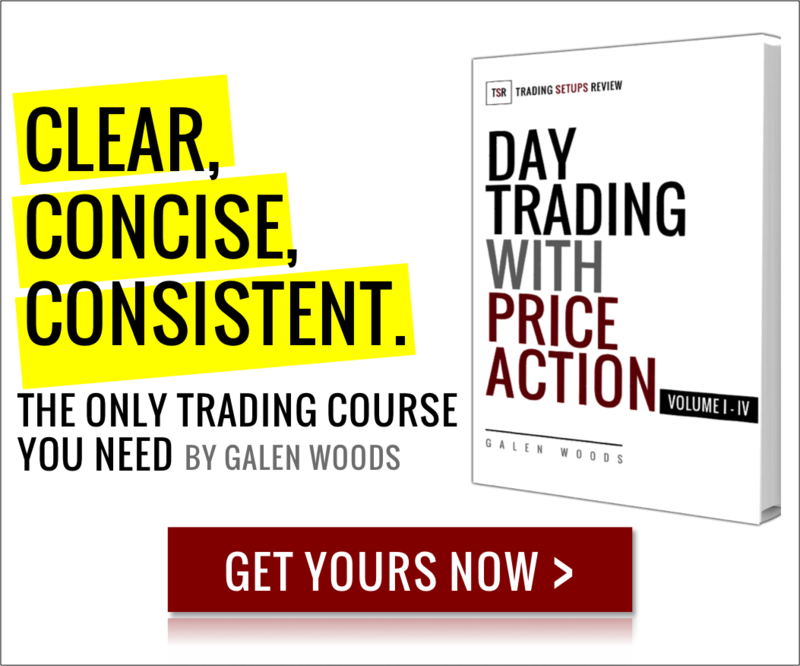 What does “price retraces” mean? The market must be in a downtrend cycle. Level 1 – Sell with a lower bar low after price retraces to the 18-period SMA. Level 2 – Sell with a lower bar low after price retraces to the 9-period SMA. Level 3 – Sell with a lower bar low after price retraces without touching any of the SMAs. This strategy was designed for the futures market so let’s stick to futures examples (ES 5-min) here. Nonetheless, you can certainly apply it to other markets. Three consecutive bars above both SMAs. Although these bars were barely above the 9-period SMA, you can see that the uptrend has begun many bars ago. This bar confirmed a retracement, and we started waiting for an entry opportunity. Place a buy stop order and trail it with each new bar high. This bar broke the high of the previous bar and triggered the buy stop order. Not all setups were successful. Pay attention to the difference between the conservative (L1) and aggressive (L3) entries. These three bars formed at a healthy distance above the two SMAs, confirming an uptrend cycle. This bar confirmed a retracement down to the SMA. From here, we could trail a buy stop order with each new bar high. The retracement went down to test the 18-period SMA and presented a Level 1 entry. This bar triggered the buy stop order, but this setup failed almost immediately. There are two warning signs here. First, the 9-period SMA sloped down during the retracement. Second, the retracement became congested (note the series of Dojis) and hence more unpredictable. Familiarize yourself with the basic strategy above before going through this section. If not, you might get overwhelmed. To avoid repetition, the tips and exceptions below are explained in the context of a bullish setup. Take Level 3 entries only in the early part of a healthy trend. The slopes of the two SMAs should stay positive during the retracement. The ideal pullback should last between two to five price bars. Bar range should stay constant or decrease during a retracement. Stop looking for entries if a bar forms entirely below the 18-period SMA. Use bar patterns to filter entries. The 9-period SMA does not have to be above the 18-period SMA. It’s acceptable if the 9-period SMA is about to cross above. You don’t need both SMAs to be sloping up. One SMA sloping up is enough. Price does not have to trade above the two SMAs for three consecutive bars. You can proceed if the market is trading high above the two SMAs. The Floor Trader System is one of my favorite trading methods for a few reasons. First, it relates strongly to price action. It focuses on the behavior of price and its relationship to the SMAs. It’s not a strategy that follows a moving average blindly. Second, it offers three levels of entries. This design is excellent for the education of a new trader. It highlights that there are different levels of setups possible with every strategy. And it ranges from the most conservative to the most aggressive. It’s a vital decision layer in every trading strategy. Third, although this trading system prescribes trading rules, it allows for discretion. You can see this from the exceptions and extra considerations stated above. Study the source material here. It is vague on a few points due to some missing parts. But don’t let this bog you down. Ultimately, what matters is what you observe in the markets and not what is written by another trader. I enjoyed applying the Floor Trader System in a variety of the markets. For a discussion on how to place stops and targets for pullback setups like the Floor Trader System, read this article. Hi. I see your charts are using 5 minute bars. Would any of the parameters change using 10 minute bars or some other time scale? Thanks. I’ve studied this strategy on various timeframes with the same parameters. However, as with all other strategies, changing the timeframe has a huge impact on the overall strategy. For day trading, one of the most important aspects is the impact on your reward-to-risk ratio. E.g. On the 10 min timeframe, your risk will be higher but your potential reward will still be limited by the range of the trading session. This will lower your reward-to-risk ratio. This just one of the many effects of using a different timeframe, and you’ll need to calibrate your trading plan accordingly.